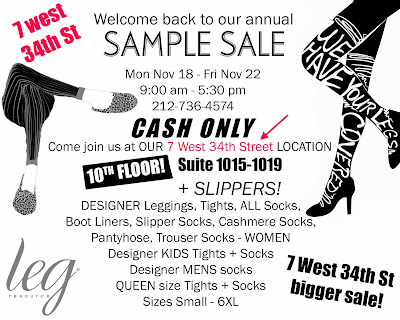 The 2014 Leg Resources Sample Sale is next week! Sample & stock sale. Designer leggings, tights, socks, boot lines, slipper socks, cashmere socks, pantyhose and more. Tights and socks for kids and mens socks. Cash only.